Pablo Hernandez’s agent has confirmed that Swansea City boss Michael Laudrup has made a ‘concrete offer’ for the Valencia winger. With Scott Sinclair strongly linked with a move to Premier League champions Manchester City, Laudrup is keen to boost his options on the wing, and Hernandez would be another big coup if the Swans boss can pull off the move. Valencia are a club struggling financially and they’ll be forced to sell their best assets if they receive any serious bids. Financial problems also benefited the Swans when they pulled off a big coup in buying Michu from Rayo Vallecano for around £2m. Laudrup recently said that he wants to sign another two players and with the expected arrival of striker Shechter on a season long loan, at least one more new arrival is expected before the end of the month. It’s been mentioned in the media that a move for Hernandez could be worth £5m or more, just a third of the £15m they recently received from Liverpool for Joe Allen. ‘The coach has spoken with Pablo and has explained his new project and that he could be a key man in the side. 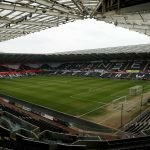 Hernandez has 4 international caps with Spain, and Laudrup is keen to bring him to the Liberty Stadium having worked with him during his time at Getafe.